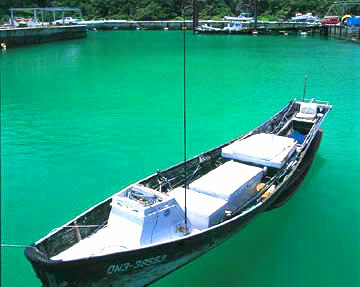 A Sabani Boat Berthing at the Harbor Tokashiki Island floats on the East China Sea, 32 km west of Naha. When you pass by the uninhabited islands of Chibishi and Maejima, Tokashiki Island appears in front of you, showing its steep hillsides and mountain cliffs about 200 m high; along the ragged coastline extends a pure white sandy beach. This small island of steep hills is 9 km in length from north to south, 2 km from east to west, and 19m around its perimeter.